If you’ve suffered a serious personal injury due to the fault of another or due to a defective drug or other product, you need attentive and vigorous legal representation. You will find these and more at my law firm. The Law Offices of John P. Nicoara represents people throughout Central Illinois who have been seriously injured by others’ negligence. My practice is devoted to protecting the rights of individuals and helping them recover fair compensation for harms done. I believe in the value of being able to give every client and every client’s case the time and attention they require. Contact us to learn how. I believe it is more important to practice law than to practice making the law a business. 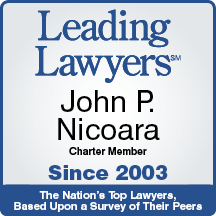 Attorney John Nicoara has been practicing law for over 40 years. He is a respected AV Peer-Review Rated Attorney through Martindale-Hubbell since 1982 and a charter member of the Leading Lawyers Network and an Illinois Super Lawyer since 2007, He has been recognized by his legal peers as an attorney whom they would retain to represent them and to whom they would refer friends and family if they were unable to take a case themselves. He not only represents victims of personal injuries but is also retained by selected insurance companies to represent their insureds who have been sued for personal injury claims, and also represents insurance companies and claimants in disputes involving liability insurance coverage disputes. Because of his active background and experience in all aspects of personal injury litigation — plaintiff, insurance defense and insurance coverage — he frequently serves as a mediator and arbitrator to resolve injury claims prior to litigation or trial. Were you injured in a car or truck accident, at a hospital, or by a dangerous product? Call our Peoria, Illinois, law office to discuss your case and schedule an initial consultation. We are available to meet with you during normal business hours and by appointment. We look forward to helping. The Law Offices of John P. Nicoara is located in Peoria, IL and serves clients in and around Peoria, Creve Coeur, Groveland, Mapleton, East Peoria, Pekin, Mossville, Washington, Peoria County and Tazewell County.